Sirchie 103LD Disposable Latent Print White Powder 1 oz. 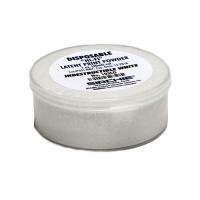 Home > Sirchie > Investigations > Evidence Gathering > 103LD Disposable Latent Print White Powder 1 oz. 103LD Disposable Latent Print White Powder 1 oz. Finding a high-quality fingerprint at a crime scene can blow a case wide open, so it makes sense to use high quality detection equipment. This one ounce container contains Sirchie's industry-leading Indestructible White disposable latent print powder, the whitest fingerprint powder available on the market. It is micro-milled for the best possible quality, fineness and consistency, and it will attract and adhere to even the weakest skin secretions. Simply apply with an ordinary fingerprint brush. The color means that it works best on dark, non-porous surfaces, as well as glass and chromed metals. ©2002-2019 CopsPlus.com: Sirchie 103LD Disposable Latent Print White Powder 1 oz.